It’s getting colder and before you know it old man winter will be here soon. Stock up on Premium Kiln-Dried Firewood now at Argyle Feed Store. 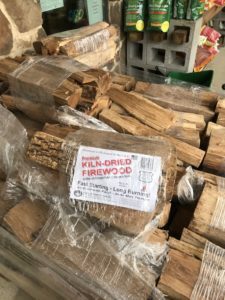 You are probably used to the seasoned firewood kind but we feel kiln-dried firewood is the best choice. Kiln dried firewood is guaranteed to burn, every time. With a very low moisture content between 10% and 15%, lighting and burning your firewood will be fast and easy. Besides the fact that kiln-dried wood is extremely easy to light and burn, this type of firewood is very energy efficient, which is great cost savings for you. As compared to the traditional choice of seasoned wood, kiln dried firewood typically produces up to 35% more heat, which means extra heat for your home. Creosote, a tar-like flammable substance builds up over time when you burn some traditional types of firewood. It’s very important to have regular cleanings to remove this build up. However, when you use kiln dried firewood, less creosote is created. This means you won’t have to have cleanings as often which will reduce your fireplace maintenance costs which will save you money over time. This entry was posted on Wednesday, December 20th, 2017 at 4:11 am	and is filed under News & Updates. You can follow any responses to this entry through the RSS 2.0 feed. Both comments and pings are currently closed.